WHY WE COSIGN: It baffles us that in 2009, companies still don&apos;t understand the importance of real-world and online synergy. Take sneaker boutiques for instance: Finding a dope sneaker shop is task in of itself. And harder still is finding an online store that stays stocked with the latest and doesn&apos;t look like a GeoCities page. So when we discovered CRSVR, we knew we struck oil. This boutique&apos;s owners understand the demand for exclusives and the need for a pleasing shopping experience. Sick brands matched with a sick in-store experience and a dope online design make for one helluva place to shop. Meeting in &apos;08 during a flight to Santa Barbara, DJ Vice and Nick Sakai immediately recognized their passion for sneakers and wasted no time setting up plans to open their own shop. Inspired by the culture they were very much a part of, these instant homies kept every aspect in mind when crafting the direction for the store. The shop features an in-house DJ to keep customers in the buying mood and a staff that has no problem answering your questions (no too-cool cocky types here). Also the lyrics to EPMD&apos;s "Crossover" are written across the back wall, letting folks know that CRSVR will never sell out—unless your talking inventory. Zing! BRANDS CARRIED: Nike, Supra, Five Four Clothing, Brixton, Ever Clothing, The Hundreds, Mishka, In4Mation, Orisue, Stussy, Future Heretics, Ransom Clothing, Fyasko Clothing, Dim Mak, G-Shock, and Nooka. MOST POPULAR ITEMS: DJ Vice: Nike Quickstrikes are hands down our most popular items. We&apos;ve had customers camp out as long as six nights in front of the store to secure a spot in line to be the first to get their hands on these super-exclusive drops. Aside from them, our Future Heretics x CRSVR &apos;I Uzi SB&apos; Collab is definitely next up. Complex: What was the inspiration behind CRSVR, and how has it influenced the overall look and feel of your store? DJ Vice: The concept for CRSVR was actually sparked on a flight to a DJ gig I had in Santa Barbara. During the flight I struck up a random conversation about sneakers with the passenger in the seat next to me. We chatted throughout the flight and upon landing decided we were going to open a sneaker store. About seven months later, CRSVR opened its doors. 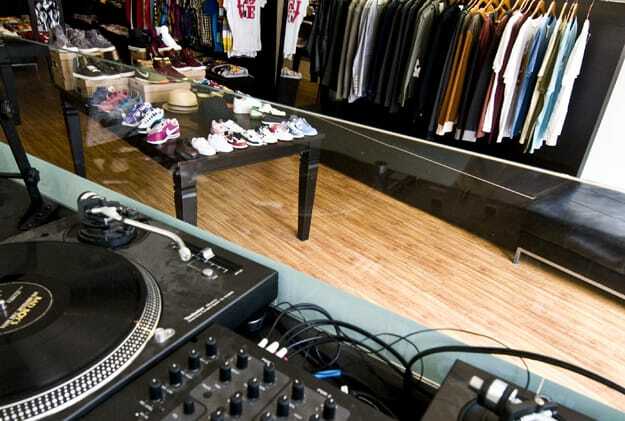 The store is definitely influenced by my DJ career, and also our own personal style. Growing up listening to and playing hip-hop, it was important for me to capture a piece of that lifestyle/culture. We try to nail the "dressed-up, dressed-down look" that is somewhere between streetwear and high fashion. Aside from that, my partner Nick and I are sneakerheads at heart. We both grew up wearing Nikes, Jordans, and Reebok Pumps. So to be able to open a boutique focused on sneakers is not only a hobby for us, but a passion that we've had since we were kids. DJ Vice: We just launched our website, crsvr.com, which has been one of our biggest projects since we first opened our doors. We kept the concept of the site similar to the store: simple, clean and fresh. We have added a couple of pretty dope features that will hopefully make us stand out a bit from other sites. We focus on our blog, our shoes, and our music. I want people to be able get our latest shoes, and also be able to download my latest mixes too. DJ Vice: We are currently working on a Halloween event with Orisue, and just wrapped a project with Future Heretics. Future Heretics was nice enough to do a collab tee for us that&apos;s exclusive to the store and online. We are definitely open to the idea and anticipate the opportunity to work with a lot of the brands we carry. Complex: What are the next trends in men&apos;s style? DJ Vice: The dressed-up streetwear look seems to be pretty popular. Everything is getting really clean. The streetwear brands are putting out cut-and-sew pieces that look like they could go in Barneys but the price points are staying true to their roots. If that continues to happen for the next five years, I wouldn&apos;t be mad at all. The shoes are tough to predict. Every time I go to Nike to see the upcoming lines, they always surprise me with classic shoes I haven&apos;t seen in 15 years, and some sort of new technology that reshapes the direction footwear is headed. They are an amazing company that is able to stay ahead of the game and create stories and product that influences a lot of the other brands out there, and we are extremely fortunate to be able to work so closely with them.